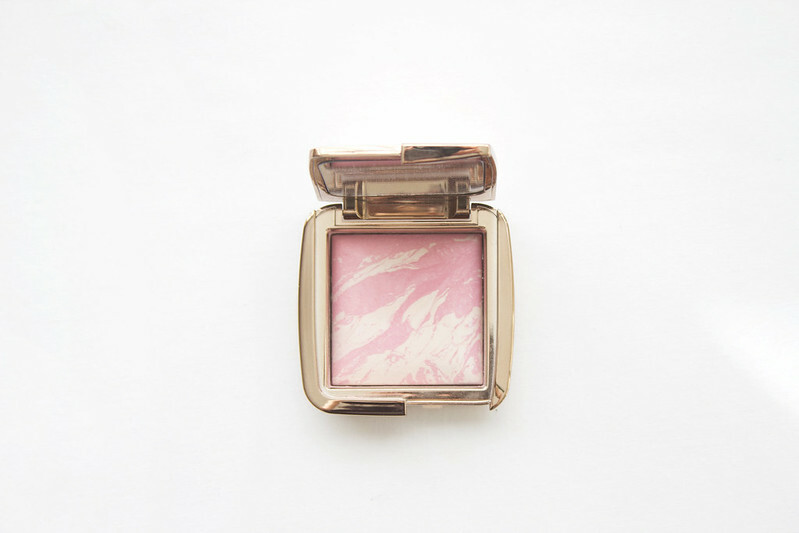 The Hourglass Ambient Lighting Blushers are "groundbreaking hybrids that combine customized lighting effects with a spectrum of breathtaking modern hues for seamless, soft-focus, and multidimensional colour." This range of blushers use 'Photoluminescent Technology' for "depth and dimension with airy, lightweight powders containing optically transparent particles that amplify colour." Despite the eyebrow raising marketing and over-written blurbs, Ethereal Glow is absolutely, freaking gorgeous regardless of whether it's been oversold with bent truths or not. The blushers are formulated so no two look alike, delivering a radiant, natural finish with buildable colour that gives a gorgeous glow to the skin. Ethereal Glow is a cool toned baby pink swirled into a pearly shade, ideal for very fair/pale complexions. It is incredibly light, appearing almost sheer on first application; it's so light it can be used as a highlighter or built up to create the most beautiful gentle flush. Quite a heavy swirl in the pan is required to pick up enough colour to use as a blush, although once it's on the cheeks it provides a natural glow that lasts several hours. 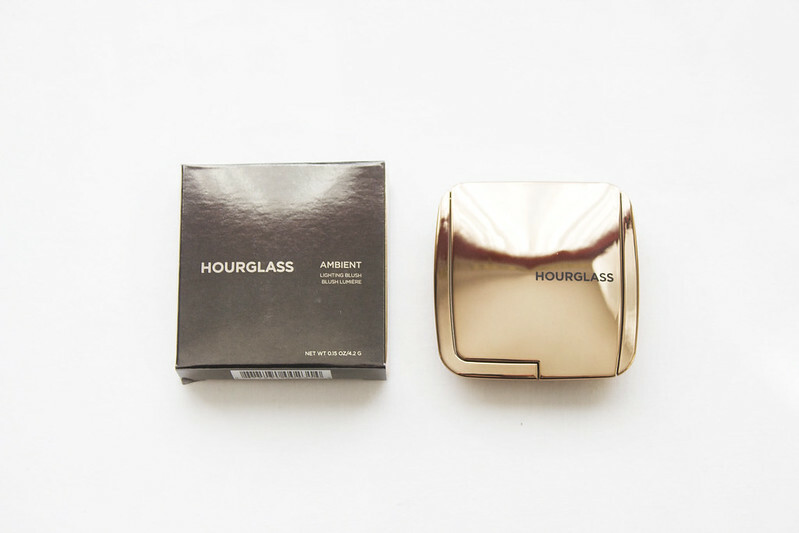 Hourglass Ethereal Glow Ambient Lighting Blush is absolutely gorgeous and while it's possible to find similar shades from other brands at not quite so high price points, I appreciate the ability to use this as a highlighter and blush to create a variety of finishes with the dual effect formula. If you want a blusher that makes you look as though you have been kissed on the cheeks by angels, buy this one. This looks lovely! id love to get my hands on the highlighter versions as well! These have been hitting my feed over the past week but yours is the first review that's actually made me think I might purchase one of these in the future. I love the ambient powders but I was a little uninspired by this latest release - probably due to what you describe as the eyebrow raising marketing and I have enough blushers to last a life time. However this does sound awesome and even though I couldn't drop £28 on one right now I think I'd consider it in the future. Who the hell doesn't want a blusher that makes you look like you've been kissed on the cheeks by angels? I want this purely because it looks so beautiful! I've read a few reviews on these and most people seem to love them. The blush itself looks stunning and with that packaging I can imagine quite a few beauty lovers are going to impulse buy these haha. Thanks for your review! I want to look like I've been kissed on the cheeks by angels. These blushes look so gorgeous and glamorous, I don't think this particular shade is right for me but I'm definitely going to be picking up one of these. I have Radiant Magenta, and I guess it's the pink big sister to this. I just look so gorgeous when I wear it. People tell me I have a glow. Ah it's so beautiful! I NEED this. I think you could definitely find similar colours from different brands with much lower price tags.. BUT Ethereal Glow is the exact colour I have been looking for and I just thought, "why not?" The other colours don't appeal to me so much though. Ahh, that is why I purchased one asap. This was a pre-order but dispatched the day after purchase..! Ahhhh, I KNOW. I kept looking at the Space.nk page and I just had to have one.. I think this shade would only suit REALLY pale people; my blusher has a lot of the highlighter shade in it and while I am super pale, it can take a bit of work getting the pink to show through. Ha, that's how I felt. This is so beautiful! I git the dim infusion shade and love it!